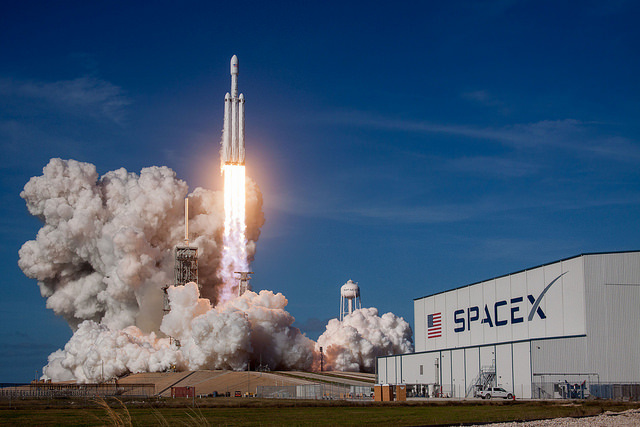 It was yesterday afternoon in Florida when SpaceX launched its Falcon Heavy rocket from Cape Canaveral on its maiden flight. What was announced as the most powerful rocket in activity launched its owner Elon Musk’s Tesla Roadster car with a dummy in a space suit nicknamed Starman to insert it into an orbit around the Sun between the Earth’s and Mars’. The idea of ​​a launcher that could carry heavy payloads into orbit but also send them to deep space with an eye towards Mars was discussed in SpaceX very early in the company’s history. The Falcon Heavy project was announced in 2011 with the idea to carry out the first test flight in 2013. Elon Musk has many merits but typically we need to add a few years to the dates he announces for his projects. In the case of the Falcon Heavy project, its development depended heavily on that of the Falcon 9 since it’s essentially a Falcon 9 with three first stages, in jargon also called boosters, side by side. The work needed to integrate those boosters with a structure that connects them caused some of the delays. Elon Musk was far from certain of the success of this Falcon Heavy test launch, mainly due to the strong stresses that the three boosters firing together are generating. Instead, the takeoff was perfect, like the other critical moments until the boosters’ separation. The two side boosters, both already used in 2016 in previous missions, were the first to separate and then begin the maneuvers that led them to landing on the platforms set up for that task at Cape Canaveral. After a few seconds the second stage also separated from the core booster, which instead attempted to land on the autonomous spaceport drone ship “Of course I still love you”. It’s normal for the communications with the drone ship to have an interruption at the landing moment due to the strong vibrations caused by the maneuver. If successful, SpaceX shows the images shortly after, when communications are restored. This time that didn’t happen and that immediately raised suspicion that something had gone wrong. After a few hours, SpaceX confirmed that the core booster failed its landing. 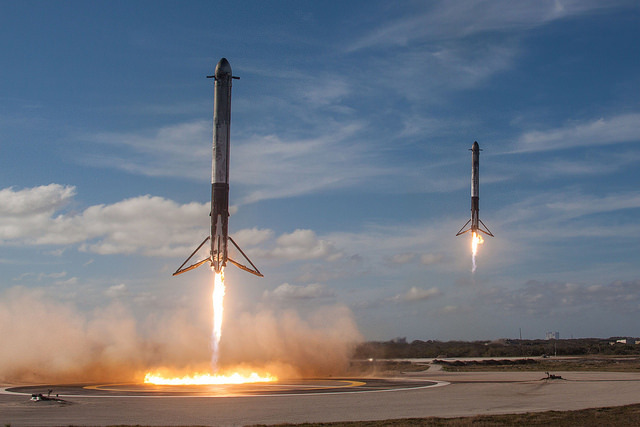 Elon Musk stated that it ran out of the fuel used to restart the engines and only one of the three needed for the braking maneuver was restarted. The consequence was that the landing occurred at a speed of almost 500 kph (300 mph) with a wrong trajectory so it was actually a violent splash down in the ocean. Meanwhile, the Falcon Heavy’s second stage continued its mission and for about 5 hours brought the Tesla Roadster with Starman on the route to put it into its final orbit. Elon Musk’s last tweet indicates that the car’s orbit will exceed Mars’ orbit to reach the asteroid belt. The on-board computer shows the words “Don’t panic” and there’s a copy of the “The Hitchhiker’s Guide to the Galaxy” on board. An optical disk capable of withstanding space conditions contains a digital library that includes Isaac Asimov’s Foundation series. The onboard radio plays songs by David Bowie. In short, there’s a big show with many science fiction references. Despite the loss of the core booster, the mission was a great success. The data collected will allow to understand the reasons for the problem at the booster: two years after the first success in the controlled landing we were taking this phase for granted but it’s still tricky and the Falcon Heavy configuration could have contributed to the failure. When the problem is solved it will be possible for SpaceX to recover the 3 boosters for each Falcon Heavy launch. This means that the most powerful rocket in activity will also allow significant cost savings compared to its competitors. In short, a great show with a launch that make history and the contemporary landing of the two side boosters but also an awareness of the economic value of this rocket. SpaceX has released an updated version of the launch webcast with additional images of the side boosters and Starman views.